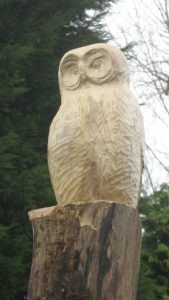 This sculpture was carved for the former Lord Mayor of Bristol, Geoff Gollop, and his family in 2009. 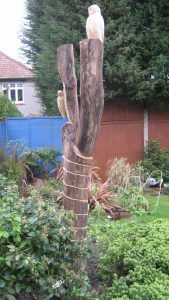 A much loved Robinia tree had to be cut down in their garden and they wanted to turn the remaining stump into a sculpture so that they could continue enjoying it. 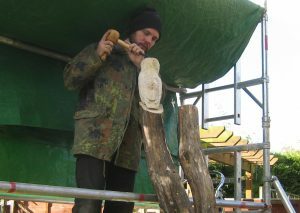 Making this culture involved using a range of tools, from chainsaws to traditional carving gouges and chisels. After discussing a few ideas with them, they decided that they would like the two life-size birds, with a pattern going up the trunk. 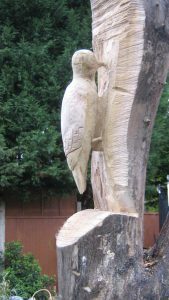 To make the woodpecker’s legs stronger, I carved them from two wooden pegs that were firmly fixed in. This meant that the grain direction made them less likely to snap. 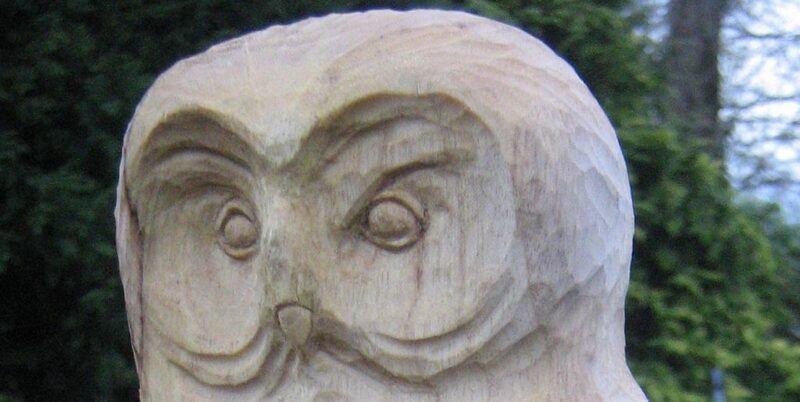 I like the idea of the slightly indignant owl being woken up by the busy woodpecker and I think that the owl’s face captures that.